What is a Judge Looking For? Home > Entering a Show > What is a Judge Looking For? A judge is someone who, in the opinion of the society organising the dog show, can assess the breeds before him and place the dogs accordingly. The judge will also, depending on the level of dog show, have passed certain judging examinations set by the Kennel Club, have bred and shown reasonable examples of their chosen breed. 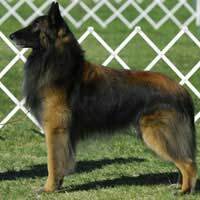 If the judge is given the honour to judge at Championship level he would have been passed by the Breed Council (or clubs) of his own breed and met all criteria set by the Kennel Club. An ‘all rounder’ is a judge who not only judges his own breed but has progressed to assessing other breeds. He (or she) cannot do this until they judge at Championship level in their own breed. To judge a group or Best in Show is a great honour and one that is not bestowed lightly by any society. It is the pinnacle of a judge’s career to be invited to judge group or Best in Show at Crufts. Whatever level of dog show, be it a Companion show or a Championship show, the judge will be doing the same thing – he will be judging the dog against the standard set down for that breed and held by the Kennel Club. If the judge is invited to assess a variety class (a class made up of dogs from different breeds) or a group, he is still comparing each dog to it’s own breed standard. When placing them he will take all these considerations into account before awarding the red card. The all rounder judge is bound to have favourites amongst the many breeds owned in this country; he wouldn’t be human if he didn’t, however in the ring he has been appointed to give an honest judgement. If you ever feel that a certain judge is not doing a good job simply keep a note of his name and remember never to enter under him again. Judges who have a reputation for dishonest judging, or do not get a good entry from exhibitors soon find themselves without invitations to judge shows! Many years ago a judge did not have to go through the rigorous training that is required of a judge these days, there again not everyone wanted to be a judge! These days no sooner has a person stepped into a show ring than they think they are entitled to become a judge. Breed Clubs and Show Societies are encouraged by the Kennel Club to arrange seminars and hands on workshops where those interested in judging can gain knowledge from their peers within the breed. The trainers themselves have to come from approved Kennel Club lists. It is compulsory to have certificates showing that you have knowledge of conformation, ringcraft and rules and regulations. If a breed club agrees that the person is competent as a judge they will place them onto a judging list that is distributed to general canine societies. This list is used when picking judges for future shows and is also held by the Kennel Club. Whatever the competence of the judge, and whatever the type of dog show entered, you should receive an honest appraisal of your dog on that day. The judge should be able to place the dogs in order of his judgement in each class. He should also have the integrity to ignore favouritism and never look to the other end of the lead while judging. He should also have the courage to withhold any award if the entrants are not worthy of such award. Quiz: Is Dog-showing Right for You? Looking for a ring craft club in central London or London in general... please contact me if you have any information..
Re: What Are Limit Shows for Dogs? I am looking for a good Ringcraft class in the North East. I live in Ashington and willing to travel. I’m looking for ring craft in Northants.